These two 1976 Gran Torinos were both used in the second through fourth (final) seasons of the TV show. The one on the left still looks exactly as it did when the show ended, but the one on the right has undergone some changes since then. Both were owned by Doug Stevenson in Ohio for many years, but the one on the right was recently purchased by Steve B. in New Jersey. Doug later sold the first one to an undisclosed but lucky new owner. Steve is currently having his restored to TV show condition. Although there has been much speculation as to who designed the cars used on the TV show, there really doesn't need to be any doubt. Read the Ford Service Life Magazine Article to learn about the origin of the TV show cars! For more information about these two cars, look at their individual pages, and read Doug S.'s Fairlaner Magazine Article. 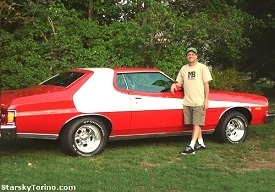 Sam R.'s Torino, on the left, was purchased from a guy who worked on the TV show and had the car in his possession since production ended - read more about it. Chris B. 's Torino, on the right, was used as a backup car during the second through fourth seasons. Chris's information about the car's use comes from an inside source - read more about it. The car on the left is from the second through fourth seasons of the series. This car sat in the hot Arizona sun for 15 years, then was bought by Steve B., who sold it to Rich M. who had it for many years, but in 2009 Steve bought it back from him. Then Greg & Lisa in Oklahoma bought it from Steve and gave it the frame-off restoration it deserved - read more about it. 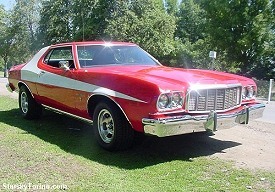 Gordon's W. 1975 Gran Torino was purchased from Spelling Goldberg Productions in 1979. That's his little sister in the Polaroid. Unfortunately, Gordon sold the car a long time ago. Nobody knows where it is now. This is the Stunt Torino used in the third season episode "Partner" - it is the car that Starsky crashes into the construction site, resulting in Hutch suffering from "amnesia" throughout the episode. Watch the crash scene in slow motion, and you'll see the round "sport" emblem on the grille, the chrome molding in front of the front wheels, and the red mirrors - all these are different than they are earlier in the episode! Hey - no stunt double looks exactly like the real star! 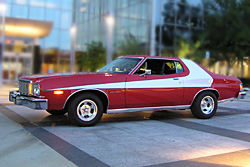 The stunt car is a 1974 Gran Torino Sport, with a 351 Cleveland and 32,000 original miles. It has been fully restored, and lived in New Jersey when these photos were taken in 1999. It has had several different owners since then, and seems to be listed as "For Sale" somewhere just about all the time. Created October, 1999. All Rights Reserved. Photos are the Property of the Car's Owner.